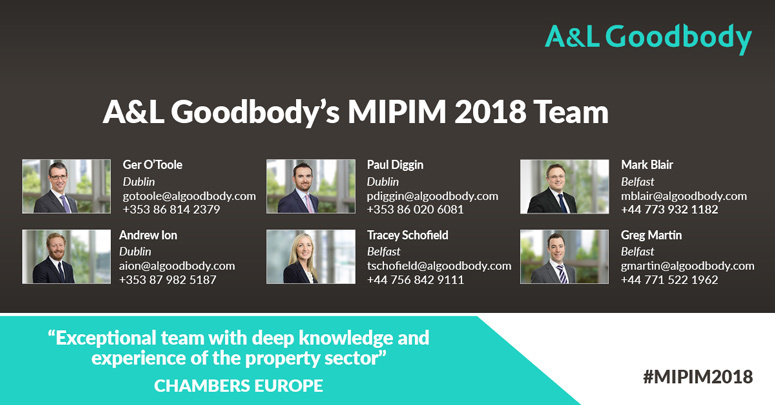 A&L Goodbody's combined Dublin and Belfast Commercial Property team looks forward to attending international property conference MIPIM between 13-16 March in Cannes. Our highly experienced all-island MIPIM team has advised on the largest real estate mandates across Ireland. This includes advising domestic and international investors, financial institutions, developers, retailers and owners/occupiers across the full range of commercial property transactions. If you would like to arrange a meeting in Cannes, please feel free to get in touch with any member of our team.